Our range of products include exclusive dress material, fancy patiala dress material, embroidered dress material, embroidered short salwar kameez, patiyala salwar suits and printed patiyala salwar kameez. We are the Leading Supplier,Trader ,Exporter and Wholesaler of Exclusive Dress Material in Chennai,Tamilnadu,India. We are the Leading Supplier,Trader ,Exporter and Wholesaler of Fancy Patiyala Dress Material in Chennai,Tamilnadu,India. We are the Leading Supplier,Trader and Wholesaler of Embroidered Dress Material in Chennai,Tamilnadu,India. We are the Leading Manufacturer,Supplier and Exporter of Embroidered Short Salwar Kameez. The offered material is designed in compliance with latest fashion trends, using quality yarns and fabric. These are provided to customers in various colors, designs and patterns at market leading prices. 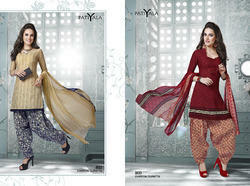 We are the Leading Supplier,Trader,Exporter and Wholesaler of Patiyala Salwar Suits in Chennai,Tamilnadu,Inidia. We are the Leading Supplier, Trader, Exporter and Wholesaler of Printed Patiyala Salwar Kameezin Chennai, Tamilnadu, India. 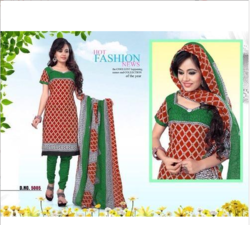 We are leading Supplier, Trader, Wholeseller and Exporter of Synthetic salwar Material. It is due to our ability to meet the bulk orders that we have been able to gain a commendable position in this domain. The optimum quality of the offered dresses is maintained at all times through various quality assurance checks conducted our team of quality controllers. Backed by a team of creative professionals, we bring forth a premium assortment of Low Range Salwar Material that is specially designed for providing a gorgeous and stunning look to women. Tailored in a regular fit, our offered fancy suit is designed using soft quality fabric and different type of embellishments. Looking for Dress Materials ?